Stauber and Rampton cite a classic example of image manipulation in this chilling analysis of the PR business. During the aftermath of the 1975 Three-Mile Island nuclear accident, a company spokesman said that a spark in the accumulated hydrogen bubble could result in a "spontaneous energetic disassembly"?otherwise known as an explosion. The authors trace certain specious practices of the $10 billion PR business to P.T. Barnum, who in 1836 wrote anonymous pro and con letters to editors about himself, generating heated interest. Modern public relations has evolved "crisis management" and "anti-" PR campaigns including sabotaging the tours of authors who challenge industry clients, for example, Jeremy Rifkin, author of Beyond Beef. The new euphemism for sewage sludge, "biosolids," is part of a campaign to convince the public that municipal sludge, replete with an astounding array of toxic substances, is good for farm soil. The authors point to Business for Social Responsibility, an organization that includes The Body Shop, Ben & Jerry's and others, as now containing "some of the most environmentally destructive corporations on the planet." Giant agencies extend their contracts to selling national policies, as Hill & Knowlton did in selling the Gulf war to the American public. Although most large news organizations at least rewrite PR materials, many smaller markets "rip and read" prepackaged video news releases. This is a cautionary reminder that much of the consumer and political world is created by for-hire mouthpieces in expensive neckties. 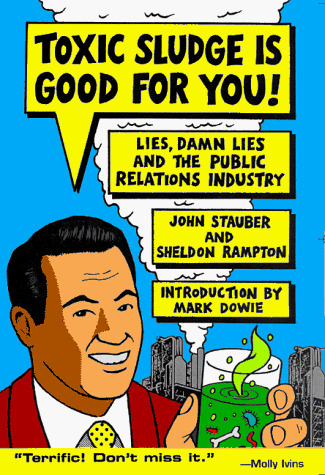 Who will hate this book more: the nation's 150,000 public relations professionals or the corporate and government clients whose scandals, scams, and shenanigans prompted those professionals to develop sophisticated spin-control techniques like greenwashing, cross-pollination, and astroturf organizing? Stauber and Rampton--editor and associate editor, respectively, of PR Watch, a newsletter published by the Center for Media and Democracy--look back to the tobacco flackery of Edward Bernays and forward to the premillenial mix of methods used by the Christian Coalition's Ralph Reed. They assess public relations' role in marketing nuclear power, infant formula, "biosolids," and authoritarian governments from Colombia to Kuwait and in orchestrating opposition to groups and reporters who have challenged corporate and sometimes government interests on such issues as product safety, the environment, animal rights, and foreign policy. Objecting mainly to the secrecy in which public relations campaigns are cloaked, the authors view NIMBY groups as a potentially positive democratic response. Appendixes offer lists of the largest public relations firms and further readings, as well as excerpts from one corporation's crisis management plan. Mary Carroll --This text refers to the Library Binding edition. The authors, editors of the journal PR Watch, show how the public relations (PR) industry helps corporations and the federal government manipulate the institutions of democracy, and detail the workings of phony grassroots campaigns, video spots broadcast as news, and other tools of America's private-sector ministries of propaganda. They look at cases, and offer guidelines for recognizing the presence of PR in the news and examples of effective citizen's campaigns. Paper edition (060-4), $16.95. Annotation c. by Book News, Inc., Portland, Or. --This text refers to the Library Binding edition. "In a series of short but informative chapters, sprinkled with humor and packed with insider information, the authors illustrate how the PR industry works round-the-clock to manipulate and deceive. ... Now a $10 billion enterprise, PR has evolved far beyond press releases and other standard devices into 'crisis management,' the hiring of spies, the suppression of free speech and even the manufacture of 'grass roots' movements. ... In a world suffused with corporate lies and propaganda, the authors show, one cannot trust the 'Workplace Health and Safety Council'--actually a corporate lobby that opposes health and safety regulations--any more than one can safely join 'Californians for Statewide Smoking Restrictions,' a front for Philip Morris. ... If you are among those convinced that at least the spin managers haven't got you fooled, read this book. You will surely think again." --This text refers to the Library Binding edition. "A powerful indictment of an industry 'designed to alter perception, reshape reality and manufacture consent.'" --This text refers to the Library Binding edition. "A font of knowledge on the anti-knowledge biz." --This text refers to the Library Binding edition. "A real eye-opener." --This text refers to the Library Binding edition. "A startling portrait of the poisoning of the American democratic process by the nation's professional spin doctors... exposes the bare-knuckled, invisible hand guiding and shaping public opinions." --This text refers to the Library Binding edition. "Written with humor and outrage at the public relations industry's worst excesses." --This text refers to the Library Binding edition. "Toxic Sludge should appear on the short list of anyone serious about the study of public relations in the United States." --This text refers to the Library Binding edition. "A chilling expose." --This text refers to the Library Binding edition.